• In June 2018, the initial Thematic Intersex NGO Report (for PSWG) (PDF) provided solid evidence of ongoing IGM practices with impunity in all 4 Nations of the UK, advocated and paid for by the State party (p. 11-16), how UK doctors and the NHS conciously dismiss human rights concerns (p. 17). In addition, it contained background on intersex and IGM (8-10). 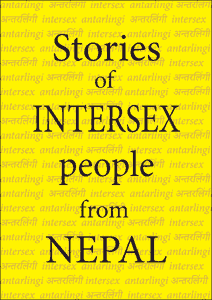 - Intersex funding is misappropriated by LGBT NGOs (p. 16-17). to be transmitted LIVE on webtv.un.org! • In March 2019 CEDAW will publish its Concluding observations with binding recommendations for the UK – hopefully including yet another strong reprimand for IGM practices for the UK! • In March 2018, the initial Thematic Intersex NGO Report (for PSWG) (PDF) provided solid evidence of ongoing IGM practices in Belgium, advocated and paid for by the State party. In addition, it showed that also children from neighbouring Luxembourg are sent to Belgium for IGM practices. 8. [...] With respect to paragraphs 133 to 135 of the State party’s report, please provide information on the progress made in eliminating harmful practices such as female and intersex genital mutilation and child marriage. • Study (federal, 2016) on terminology and care discourse concerning intersex people in Belgium. Afterwards, a study on the living situation of these people (Flanders). • Support for the creation of a website for people born with atypical sexual characteristics by Flanders. • Federal funding for the development of information kits for intersex children and parents. • Subsidy to associations fighting against genital mutilation of intersex children, such as Genres pluriels. • Etude (fédérale, 2016) sur la terminologie et le discours de prise en charge concernant les personnes intersexes en Belgique. Ensuite, étude sur la situation de vie de ces personnes (Flandre). • Soutien à la création d’un site web concernant les personnes nées avec des caractéristiques sexuelles atypiques par la Flandre. • Financement fédéral de l’élaboration de trousses d’information adressées aux enfants intersexes et aux parents. • Subvention d’associations luttant contre les mutilations génitales des enfants intersexes, telles Genres pluriels. • Above December 2018 follow-up Thematic Intersex NGO Report (for Session) (PDF) documents recent developments including also children from Luxembourg and Malta submitted to IGM in Belgium (p. 7), Belgian hospitals involved in international IGM networks (p. 7-8), and how Belgian government bodies, in the name of promoting "Rights of intersex people", in fact further promote and subsidise IGM practicioners and their institutions (p. 8-10); and it investigates the claims made by Belgium in its answers to the LOI (p. 11-14). The submitted version of the Report also contains a personal testimony of an IGM survivor (not included in the public version). • In February 2019 the CRC will publish its Concluding observations with binding recommendations for Belgium – hopefully followed by yet another strong reprimand for IGM practices for Belgium! • In March 2018, the initial Thematic Intersex NGO Report (for PSWG) (PDF) provided solid evidence of ongoing IGM practices in Italy, advocated and paid for by the State party (p. 10-14). In addition, it shows how Italian case law promotes and endorses IGM by punishing its prevention (p. 11-12). • In Italy's written answers to the LOI published in October 2018, the State party replied (CRC/C/ITA/Q/5-6/Add.1, paras 105-106). 106. Data on this point is available in Annex I (Tab 17). - A list of 15 ICD9-CM procedures to determine cases of relevant "urogenital surgical procedures"
• Above December 2018 follow-up Thematic Intersex NGO Report (for Session) (PDF) investigates the statistic claims made by Italy, and documents much higher numbers published by Italian IGM doctors themselves (p. 10-12). It also contains personal testimonies from IGM survivors (p. 14-19), and extensive evidence of the most common IGM practices in Italy (p. 20-24). • In February 2019 the CRC will publish its Concluding observations with binding recommendations for Italy – hopefully followed by yet another strong reprimand for IGM practices for Italy! • Precedent: In May 2016, after having reviewed the human rights record of France in Geneva, and based on evidence and testimony compiled and presented by Vincent Guillot, Nadine Coquet and StopIGM.org, the Committee against Torture (CAT) reprimanded France for IGM, condemning the practice as cruel, inhuman or degrading treatment in violation of the Convention against Torture, and in its "Concluding observations" obliged France to "take the necessary legislative, administrative and other measures" to prevent IGM, compensate survivors and guarantee adequate counselling and support. • Above June 2018 NGO Report provides solid evidence of ongoing IGM practices in France, and of the failure of France to implement the 2016 binding recommendations by CAT (as well as those by CRC and CEDAW). • The State party has now to answer to the LOIPR in writing in its State report. Thereafter, NGOs will have another possibility to submit NGO reports. • Finally the actual State review will take place in Geneva, hopefully followed by yet another strong reprimand for IGM practices for France. 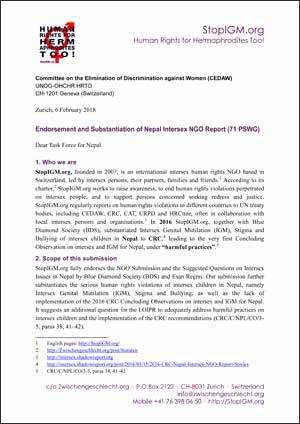 • In February 2018, Esan Regmi (Blue Diamond Society, Nepal) and StopIGM.org first submitted Intersex NGO Reports (for LOI) to CEDAW, raising and substantiating violations against intersex children, adolescents and adults in Nepal. • In March 2018 during its 71st PSWG Session, the Committee heard NGOs in a private meeting, including a Joint Intersex Statement (PDF) by Esan Regmi and Parsu Ram Rai (Blue Diamond Society, Nepal) and StopIGM.org, raising infanticide, child abandonment, intersex genital mutilation, forced marriage, massive bullying preventing intersex children from attending school, and more. 8. The State party indicates that it, in collaboration with civil society organizations, is implementing campaigns to address harmful practices, such as forced and child marriages and accusations of witchcraft (para. 27). [...] Please also provide information on [..] (d) measures taken to address the forced genital mutilation of and discrimination against intersex persons, including reported cases of abuse, infanticide and forced marriage. This marked the first time ever that a UN Committee explicitly addressed infanticide and forced marriage of intersex persons! • The Government had then to submit written answers to the questions in the LOI, which it did only well after the deadline late in September 2018 (merely a week before the deadline for the NGO follow-up reports for the Session). While the Replies to the LOI (CEDAW/C/NPL/Q/6/Add.1, para 41) repeat the above questions on intersex, they completely fail to provide any answer. 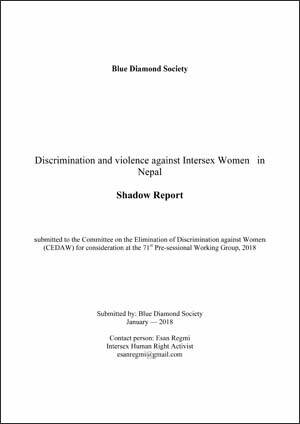 • Early October 2018, Esan Regmi and Parsu Ram Rai (Blue Diamond Society, Nepal) and StopIGM.org submitted above thematic follow-up Joint Intersex NGO Report (for Session, PDF) (INT/CEDAW/CSS/NPL/32600), providing solid evidence of the serious human rights violations against intersex people based on stereotypes and prejudice, and also of the failure of the Government to act. • In November 2018 the Committee will publish its “Concluding Observations” – hopefully with yet another severe reprimand for IGM practices for Nepal. UPDATE!!! UN-CEDAW condems Intersex Infanticide and Genital Mutilation in Nepal! • And from 18–29 November the Special Rapporteur on Violence against Women, its Causes and Consequences, Ms. Dubravka Šimonović, will undertake an official country visit to Nepal. Esan Regmi and Parsu Ram Rai (Blue Diamond Society, Nepal) and StopIGM.org also submitted a Report “Harmful Practice and Violence against Intersex Children and Adolescents in Nepal” (PDF) to the Special Rapporteur. Hopefully, also the Special Rapporteur will denounce harmful practices on intersex people in Nepal in her upcoming Report on the Country visit. • Above June 2017 NGO Report provides solid evidence of ongoing IGM practices in Switzerland, no legal protections for children at risk and no access to redress and justice for survivors, in clear contradiction of the 2015 CAT binding recommendations for Switzerland. • In December 2017 during its 62nd Session, the Committee drafted the List of Issues Prior to Reporting (LOIPR) with questions for Switzerland. • Finally the actual State review will take place in Geneva, hopefully followed by yet another severe reprimand for IGM practices for Switzerland. • Above July 2018 NGO Report provides solid evidence of ongoing IGM practices in Germany. • In September 2018 during its 20th Session, the Committee heard NGOs in a private meeting. As requested by the Coutry rapporteurs, our Statement focused of the intersectionality of intersex and disability: >>> StopIGM.org Statement DOCX | PDF. (b) Initiatives to implement its recommendations relating to intersex children (CRPD/C/DEU/CO/1, para 38 (d)). • Finally the actual State review will take place in Geneva, hopefully followed by yet another severe reprimand for IGM practices for Germany. • The Concluding Observations for Chile, hopefully including yet another severe reprimand for IGM practices, will be published after the end of the 64th CAT session (10 Aug 2018). • The Concluding Observations for Liechtenstein (and Mexico, New Zealand and Australia) include yet another reprimand for IGM practices for each country. • The Concluding Observations for New Zealand (and Liechtenstein, Australia and Mexico) include yet another severe reprimand for IGM practices for each country. • The Concluding Observations for México (and Liechtenstein, Australia and New Zealand) include with yet another severe reprimand for IGM practices for each country. • September 2017: Pre-session NGO Report by StopIGM.org, presenting solid evidence of how today healthy intersex children are still submitted to IGM, paid for by the Universal Health Care System under the oversight of the Argentinian Ministry of Health, causing lifelong severe pain and suffering (>>> Download PDF). • November 2017: Unfortunately, the Pre-Sessional Working Group compiling the List of Issues (LoI) with questions for Denmark for the session did NOT include intersex or IGM. • April 2017: Joint Thematic NGO Report, providing updated solid evidence of how today healthy intersex children are still submitted to IGM, paid for by the Universal Health Care System under the oversight of the Argentinian Ministry of Health, causing lifelong severe pain and suffering (see above). • The Concluding Observations for Argentina, hopefully including another severe reprimand for IGM, are due to be published in June after the Session. • Above March 2018 NGO Report (for PSWG) provides solid evidence of ongoing IGM practices in Belgium, advocated and paid for by the State party. In addition, it shows that also children from neighbouring Luxembourg are sent to Belgium for IGM practices. • The State party has now to answer to the LOI in writing. Thereafter, NGOs will have another possibility to submit NGO reports. • Finally the actual State review will take place in January 2019 Geneva, hopefully followed by yet another strong reprimand for IGM practices for Belgium. • Above March 2018 NGO Report (for PSWG) provides solid evidence of ongoing IGM practices in Italy, advocated and paid for by the State party. In addition, it shows how Italian case law promotes and endorses IGM by punishing its prevention. (f) The number of non-urgent, irreversible surgical and other procedures that have been undertaken on intersex children before an age at which they are able to provide informed consent;• The State party has now to answer to the LOIPR in writing in its State report. Thereafter, NGOs will have another possibility to submit NGO reports. • Finally the actual State review will take place in January 2019 Geneva, hopefully followed by yet another strong reprimand for IGM practices for Italy. • December 2017: Thematic NGO Report, presenting providing solid evidence of how today healthy intersex children are still submitted to IGM, paid for by the National Health System (SNS), causing lifelong severe pain and suffering (see above). • The Concluding Observations for Spain published on Thursday 8 February include yet another severe reprimand for IGM practices! YAY! !